From gracing endless Instagram shots to being a prime destination for island hoppers, beach bums, culture vultures, foodies and history lovers, Greece’s gorgeous coastline, old world ruins and cities are tailormade for travel. And this award-winning Greek island hopper trip from Buasabout is the perfect way to explore this incredible country. Take a deep dive into Greece’s godly attractions, myths and legends by beginning your adventure in the ancient capital of Athens. You can visit a temple that belonged to the goddess of war, Athena and the UNESCO World Heritage Sites of in the sprawling citadel of Acropolis. But in Greece, the divine is not limited to the gods. From Athens, set off for the magical island of Mykonos, a place where island life is at its best. Mortal bodies sip cocktails at beach bars, party all night, eat dinner against the backdrop of a Grecian sunset and wake up to celestial views across the bright blue Aegean Sea. After hedonism on Mykonos, seek heavenly respite on the island of Paros. Feast on barbecued food, go snorkelling and discover realms below the sea, lose yourself to blissful rural villages and peaceful coastline. From here you’ll set sail towards Santorini. Santorini is teeming with luxury, Instagrammers and infinity pools. The island’s volcanic sands, mesmerising sunsets, beautiful cliffside towns like Fira and Oia and spots for a beachside picnic or dinner, inspire wanderlust all over the world. And it’s the perfect place for a night out in paradise. End your final night of island hopping on a high in Ios, where alongside hiking and thrilling water activities, you can party until the early hours of the morning, before watching one last island sunrise in Greece. Island hopping around Greece is one of the best ways to drift away on cloud nine and experience this fabulous country. 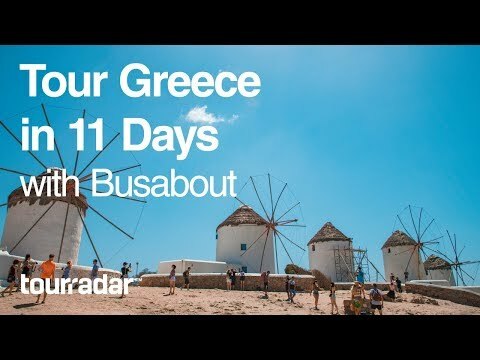 Whether you’re ready to set sail today, or dreaming of your next trip, why not head to TourRadar and check out Busabout’s Greek Island Hopper for yourself?